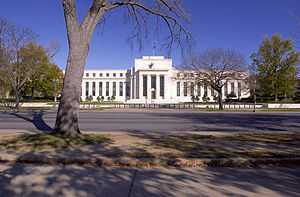 The Federal Reserve System is headquartered in the Eccles Building on Constitution Avenue in Washington, DC. The Federal Reserve System (also known as the Federal Reserve; informally The Fed) is the central banking system of the United States. It was created via the Federal Reserve Act of December 23, 1913. All national banks were required to join the system and other banks could join. Federal Reserve Notes were created as part of the legislation, to provide an elastic supply of currency. Composed of a board of governors, twelve regional banks, and numerous private member banks, the Federal Reserve acts as the fiscal agent for the U.S. government, but is maintained independently under rules designed to prevent political interference. Responsible for maintaining the stability of the nation's currency and money supply, it regulates reserve requirements and discount rates for member banks, as well as conducting open market operations to adjust the monetary supply. The Federal Reserve has on occasion faced serious criticism, particularly with regard to its failure to avoid, with accusations of contributing to, the Great Depression and other extreme instabilities in the business cycle in the twentieth century. Given the significant role of the United States in the world, and, following the collapse of the gold standard and the position of the U.S. dollar as a reserve currency, pressures on the Federal Reserve to control inflation and maintain economic stability are severe. Thus, the Federal Reserve cannot act only for the benefit of its nation alone, but is also responsible to serve the world community. numerous private member banks, which own varying amounts of stock in the regional Federal Reserve Banks. The establishment of the bank raised early questions of constitutionality in the new government. Hamilton argued that the Bank was an effective means to achieve the authorized powers of the government implied under the "necessary and proper" clause of the constitution. The Bank was bitterly opposed by Thomas Jefferson and James Madison, who saw it as an engine for speculation, financial manipulation, and corruption. Secretary of State Jefferson argued that the Bank violated traditional property laws and that its relevance to constitutionally authorized powers was weak. However their chief financial advisor, Albert Gallatin, recognized its value. Congress refused to extend the Bank's charter in 1811, and as a result Madison's government had great difficulty financing the War of 1812. The Second Bank of the United States was chartered in 1816, five years after the expiration of the First Bank. It was founded during the administration of James Madison out of desperation to stabilize the United States dollar. Basically a copy of the First Bank, it had branches across the country and served as the repository for Federal funds until 1836. Andrew Jackson, who became president in 1828, denounced it as an engine of corruption that benefited his enemies and refused to recharter it after a famous dispute with the Bank's president, Nicholas Biddle. The Bank then became a private institution until it became defunct in 1841. From 1837 to 1862, in the "Free Banking Era" there was no formal central bank. From 1862 to 1913, a system of national banks was instituted by the National Banking Act of 1863. A series of bank panics, in 1873, 1893, and 1907, caused by market speculation and the actions of international banks, provided public support for the creation of a centralized banking system, which it was thought would provide greater stability. Following the Panic of 1907, Congress created the National Monetary Commission to draft a plan for reform of the banking system. Senate Republican leader and financial expert Nelson Aldrich was the head of the Commission. After going to Europe with a team of experts and being amazed at how much better were the European central banks, Aldrich in 1910 met with leading bankers, including Paul Warburg, Frank Vanderlip of the National City Bank, Henry Davison of J.P. Morgan Company, and Benjamin Strong, also of J.P. Morgan. In this meeting, the Aldrich Plan was drafted, which became the Federal Reserve Act of 1913. Aldrich realized correctly that a central bank had to be (contradictorily) decentralized somehow, or it would be vulnerable to local politicians and bankers as were the First and Second Banks of the United States. His solution was a regional system. President Woodrow Wilson added the provision that the new regional banks be controlled by a central board appointed by the president. William Jennings Bryan, by now Secretary of State, long-time enemy of Wall Street and still a power in the Democratic party, threatened to destroy the bill. Wilson masterfully came up with a compromise plan that pleased bankers and Bryan alike. 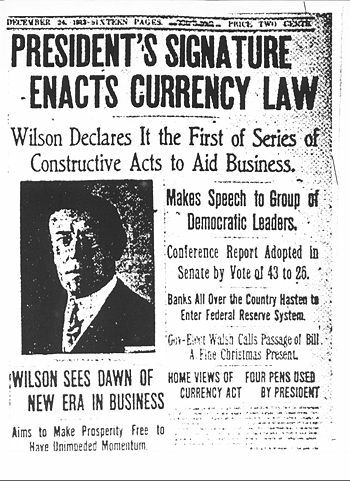 Wilson started with the bankers' plan that had been designed for conservative Republicans by banker Paul Warburg. The agrarian wing of the party, led by William Jennings Bryan, wanted a government-owned central bank which could print paper money whenever Congress wanted; Wilson convinced them that because Federal Reserve notes were obligations of the government, the plan fit their demands. Southerners and westerners learned from Wilson that the system was decentralized into 12 districts and surely would weaken New York and strengthen the hinterlands. One key Congressman, Carter Glass, was given credit for the bill, and his home of Richmond, Virginia, was made a district headquarters. Powerful Senator James A. Reed of Missouri was given two district headquarters in St. Louis and Kansas City. The Federal Reserve's power developed slowly in part due to an understanding at its creation that it was to function primarily as a reserve, a money-creator of last resort to prevent the downward spiral of withdrawal/withholding of funds which characterizes a monetary panic. At the outbreak of World War I, the Federal Reserve was better positioned than the Treasury to issue war bonds, and so became the primary retailer for war bonds under the direction of the Treasury. After the war, Paul Warburg and New York Governor Bank President Benjamin Strong convinced Congress to modify its powers, giving it the ability to both create money, as the 1913 Act intended, and destroy money, as a central bank could. During the 1920s, the Federal Reserve experimented with a number of approaches, alternatively creating and destroying money and, in the eyes of many scholars (notably Milton Friedman), helping to create the late-1920s stock market bubble. In 1928, Strong died. He left a tremendous vacuum in governance from which the bank did not recover in time to react to the 1929 collapse (as it did after 1987's Black Monday), and what most would consider today to be a restrictive policy was adopted, exacerbating the crash. After Franklin D. Roosevelt took office in 1933, the Fed became subordinated to the Executive Branch. In 1951, an accord was reached granting full independence over monetary matters. Federal Reserve headquarters, Eccles Building, Washington, DC. Each privately owned Federal Reserve Bank and each member bank of the Federal Reserve System is subject to oversight by a Board of Governors (see generally 12 U.S.C. § 248). The seven members of the board are appointed by the President and confirmed by the Senate(12 U.S.C. § 241). Members are selected to terms of 14 years (unless removed by the President), with the ability to serve for no more than one term (12 U.S.C. § 242). A governor may serve the remainder of another governor's term in addition to his or her own full term. The Federal Open Market Committee (FOMC), created under 12 U.S.C. § 263, comprises the seven members of the board of governors and 5 representatives selected from the Federal Reserve Banks. The representative from the 2nd District, New York, is a permanent member, while the other banks rotate on two and three year intervals. 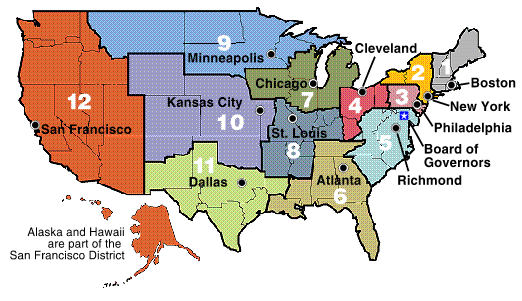 The twelve regional Federal Reserve Banks, which were established by the Congress as the operating arms of the nation's central banking system, are organized much like private corporations. The Reserve Banks issue shares of stock to "member banks." However, owning Reserve Bank stock is quite different from owning stock in a private company. The Reserve Banks are not operated for profit, and ownership of a certain amount of stock by a "member bank" is, by law, a condition of membership in the system. The stock may not be sold or traded or pledged as security for a loan; dividends are, by law, limited to 6 percent per year. The largest of the Reserve Banks, in terms of assets, is the Federal Reserve Bank of New York, which is responsible for the Second District covering the state of New York, the New York City region, Puerto Rico, and the U.S. Virgin Islands. The dividends paid by the Federal Reserve Banks to member banks are considered partial compensation for the lack of interest paid on member banks' required reserves held at the Federal Reserve Banks. By law, banks in the United States must maintain fractional reserves, most of which are kept on account at the Federal Reserve. The Federal Reserve does not pay interest on these funds. The Board of Governors of the Federal Reserve System is an independent government agency. It is subject to laws like the Freedom of Information Act and the Privacy Act which cover Federal agencies and not private entities. Like some other independent agencies, its decisions do not have to be ratified by the President or anyone else in the executive or legislative branches of government. The Board of Governors does not receive funding from Congress, and the terms of the members of the Board span multiple presidential and congressional terms. Once a member of the Board of Governors is appointed by the president, he or she is relatively independent (although the law provides for the possibility of removal by the President "for cause" under 12 U.S.C. section 242). Central bank independence from political control is a crucial concept in both economic theory and practice. The problem arises as central banks strive to maintain a credible commitment to price stability, when the markets know that there is political pressure to keep interest rates low. Low interest rates tend to keep unemployment below trend, encourage economic growth, and allow for cheap credit and loans. Some models however say such a policy is not sustainable without accelerating inflation in the long term. Thus, a central bank believed to be under political control cannot make a credible commitment to fight inflation, as the markets know that politicians will lobby to keep rates low. It is in this limited sense that the Federal Reserve System is independent. The members of the FOMC are not elected and do not answer to politicians in making their interest rate decisions. The Federal Reserve System is financially independent because it runs a surplus, due in part to its ownership of government bonds. In fact, it returns billions of dollars to the government each year. However, the Federal Reserve is still subject to oversight by the Congress, which periodically reviews its activities and can alter its responsibilities by statute. In general, the Federal Reserve System must work within the framework of the overall objectives of economic and financial policy established by the government. The Federal Reserve uses several mechanisms to implement monetary policy. These include direct control methods such as regulating the amount of money that a member bank must keep in hand as reserves and changing the discount rates on interest charged to banks that borrow from the Federal Reserve System. The Federal Reserve may also use indirect control methods through open market operations. In its role of setting reserve requirements for the country's banking system, the Federal Reserve regulates what is known as fractional-reserve banking. This is the common practice by banks of retaining only a fraction of their deposits to satisfy demands for withdrawals, lending the remainder at interest to obtain income that can be used to pay interest to depositors and provide profits for the banks' owners. Some people also use the term to refer to fiat money, which is money that is not backed by a tangible asset such as gold. Member banks lend out most of the money they receive as deposits. If the Federal Reserve System determines that member banks must keep in reserve a larger fraction of their deposits, then the amount that the member banks can lend drops, loans become harder to obtain, and interest rates rise. 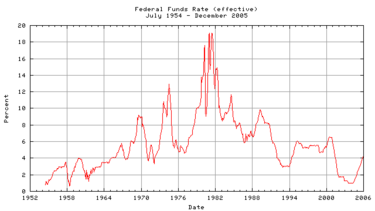 The Federal Reserve System implements monetary policy largely by targeting the federal funds rate. This is the rate that member banks charge each other for overnight loans of federal funds. Member banks borrow from the Federal Reserve System to cover short-term needs. The Federal Reserve System directly sets the "discount rate," which is the interest rate that banks pay to borrow directly from it. This rate has an effect, though usually rather small, on how much money the member banks will lend. Both of these rates influence the Wall Street Journal prime rate, which is usually about three percentage points higher than the federal funds rate. The prime rate is the rate that most banks use to price loans for their best customers. Lower interest rates stimulate economic activity by lowering the cost of borrowing, making it easier for consumers and businesses to buy and build. Higher interest rates slow the economy by increasing the cost of borrowing. The Federal Reserve System also controls the size of the money supply by conducting open market operations, in which the Federal Reserve engages in the lending or purchasing of specific types of securities with authorized participants, known as primary dealers. All open market operations in the United States are conducted by the Open Market Desk at the Federal Reserve Bank of New York. The Open Market Desk has two main tools to make adjustments in the monetary supply: repurchase agreements and outright transactions. To smooth temporary or cyclical changes in the monetary supply, the desk engages in repurchase agreements with its primary dealers. These are essentially secured, short-term loans by the Federal Reserve. Since there is an increase of bank reserves during the term of the agreement, this temporarily increases the money supply. To temporarily contract the money supply, the Federal Reserve may borrow money from the reserve accounts of primary dealers in exchange for Treasury securities as collateral. The other main tool available to the Open Market Desk is the outright transaction, which involves the purchase (or sale) of Treasury securities on the open market. These transactions result in a permanent decrease (or increase) in the money supply. When the Federal Reserve System buys securities, it in effect puts more money into circulation and takes securities out of circulation. With more money around, interest rates tend to drop, and more money is borrowed and spent. When the Federal Reserve sells government securities, the reverse takes place. The Federal Reserve came under serious criticism following the Great Depression. At one extreme are a few economists from the Austrian School and the Chicago Schools of economics who want the Fed abolished. They criticize its expansionary monetary policy in the 1920s, allowing misallocations of capital resources and supporting a massive stock price bubble. Milton Friedman of the Chicago School, has argued that the Federal Reserve did not cause the Great Depression but made it worse by contracting the money supply at the very moment that markets needed liquidity. Friedman has argued that the Federal Reserve could, and should, be replaced by a computer system that sets rates calculated from standard economic metrics. Economists of the Austrian School have argued that the Federal Reserve's manipulation of the money supply to stop "gold flight" from England caused malinvestment, leading to the Great Depression. Another criticism of the Federal Reserve System is that it is shrouded in secrecy. Meetings are held behind closed doors, and the transcripts are released with a lag of five years. Even expert policy analysts are unsure as to the logic behind its decisions. It has also been known to be standoffish in its relations with the media in an effort to maintain its carefully crafted image and resents any public information that runs contrary to this notion. The style of communication used by its representatives is jargon-laden, fence-sitting, and opaque, and is often referred to as "Fed speak." Critics argue that such opacity leads to greater market volatility, as the markets must guess, often with only limited information, about how policy will change in the future. Economists of the Austrian School such as Ludwig von Mises have contended that it was the Federal Reserve's artificial manipulation of the money supply that led to the boom/bust business cycle that was evidenced over the twentieth century. In general, laissez-faire advocates of free banking argue that there is no better judge of the proper interest rate and money supply than the market. Nobel Economist Milton Friedman has said that he "prefer[s] to abolish the Federal Reserve System altogether.". Some political parties, such as the Libertarian Party  and the Constitution Party, hold the position that the Federal Reserve should be abolished on legal and economic grounds. They argue that the Federal Reserve proposal was unconstitutional from its inception, because the Federal Reserve System was to be a bank of issue, citing the Constitution which expressly grants Congress "the power to coin money and regulate the value thereof." In popular culture, criticisms include novels and movies suggesting that the people's power over the U.S. Government has been usurped and is instead controlled by the interests of Federal Reserve through their manipulation of monetary policy and corporate banking allies. Others have suggested that the Federal Reserve System was planned in secret by several extremely rich and powerful people for the purposes of furthering their family wealth and political power. The Federal Reserve System needs to continually improve in the following areas: communication, payment system, and monetary policies. 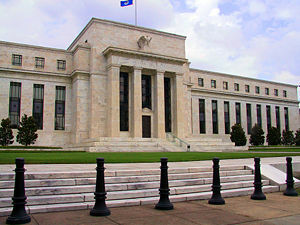 The Federal Reserve System must be able to constantly develop communication, as globalization demands immediate world-wide connection. Monetary policies must be constantly updated to be more effective in maintaining stability of the U.S. dollar, which as a reserve currency is crucial to the world economic community. Continued development in the payment system must take place to keep apace with advances in technology, such as electronic payments. The Federal Reserve, as the central bank of the United States, the most influential economic power in the world, carries immense responsibility not only for the United States but for the whole world. As such, it is essential that it continually improves its operations and maintains the trust of the public. ↑ Who owns the Fed? ↑ Lewis vs. United States.Retrieved May 28, 2008. ↑ National Platform of the Libertarian Party Retrieved May 28, 2008. ↑ Thomas M. Hoenig, 2001. Leadership Progress and the Federal Reserve System. Retrieved May 28, 2008. Epstein, Lita & Preston Martin. (2003). The Complete Idiot's Guide to the Federal Reserve. Alpha Books. ISBN 0028643232. Hafer, R. W. The Federal Reserve System: An Encyclopedia. Westport: Greenwood Press, 2005. 280 entries; ISBN 0313328390. Meyer, Lawrence H. (2004). A Term at the Fed: An Insider's View. New York: HarperBusiness. ISBN 0060542705; focuses on the period from 1996 to 2002, emphasizing Alan Greenspan's chairmanship during the Asian financial crisis, the stock market boom and the financial aftermath of the September 11, 2001 attacks. Woodward, Bob. (2000) Maestro: Greenspan's Fed and the American Boom. New York: Simon & Schuster/Touchstone ed. 2001. 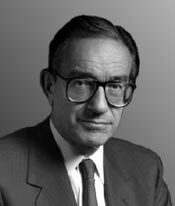 ISBN 0743205626 study of Greenspan in 1990s. Chandler, Lester V. American Monetary Policy, 1928-41. New York: Harper and Row, 1971. Griffin, G. Edward. "The Creature from Jekyll Island|The Creature from Jekyll Island: A Second Look at the Federal Reserve" (1994) reprint 2008 ASIN: B00181HBR0 ISBN 0912986212; Says Fed was created by a conspiracy of bakers; his other books charge Franklin Rooosevelt intentionally brought about Pearl Harbor. Kubik, Paul J. "Federal Reserve Policy during the Great Depression: The Impact of Interwar Attitudes regarding Consumption and Consumer Credit." Journal of Economic Issues 30 (3) (1996): 829+ . Link, Arthur. Wilson: The New Freedom. Princeton Univ. Press, 1956. ISBN 069104578X 199-240. Explains how Woodrow Wilson managed to pass the legislation. Mayhew, Anne. "Ideology and the Great Depression: Monetary History Rewritten." Journal of Economic Issues 17 (June 1983): 353-360. A Brief History of Central Banking in the United States by Edward Flaherty. History of "Federal Reserve System"
This page was last modified on 4 April 2017, at 20:34.